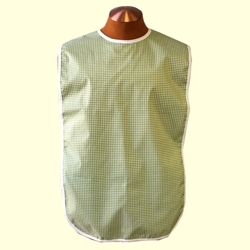 This is our new light green plaid adult bib that has a full waterproof back barrier and measures 18" wide and 35" long. It has a double snap neck closure for a tighter or looser fit. It has heavy white binding on the edge. Has a FULL waterproof vinyl back barrier to keep spills from leaking through onto clothing. 18"W x 35"L allows the bib to cover the lap of most people.